We live in a technological age. Soundbites and memes dominate our social media feeds. Visual, interactive, alluring clips are what the pundits tell us will attract people’s gaze. And nearly every presentation we see has a multimedia edge. So why is it that our smiles widen so broadly when onto our doormats drops something as simple as a handwritten note? 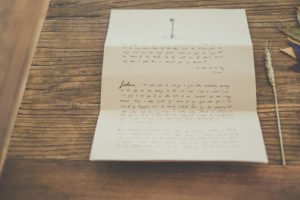 The envelope can be curled, the writing slightly smudged by the rain – it contains no words that could not be more quickly communicated by email or text – but there’s no denying its impact in ways that are profound. Maybe it’s simply because it’s rare – we don’t get much via “snail mail” these days. Maybe it’s because it’s physical – there’s something precious about being able to hold a message, not just see it flash before our eyes. Maybe it’s because it communicates “I’ve taken time over you – I’ve done something unusual to show how much I care”. Whatever the reason, I’m much more likely to read a note twice than I am a message on WhatsApp – I file it away to be rediscovered and re-enjoyed at some point in the future rather than simply hitting delete. Assuming I’m not alone in my delight of the handwritten note, it’s worth asking ourselves the place of writing in pastoral care. Before modern technology, letter-writing was standard practice for the Christian hoping to encourage those in need. Whether it was Paul penning letters to Timothy 2,000 years ago or the kind of notes that you can read in books like Heart of a Servant Leader, Christians have always known that spurring one another on to love and good works includes not just the spoken word but the written one, too. We have a rich tradition of providing those struggling with something biblical, practical, personal, tangible and re-readable to help them persevere. One that, whilst not lost, seems to have waned in recent years – or morphed into the more transient and disposable electronic milieu. Arguably, a well-crafted short note is often gentler, clearer, more personal and more infused with Bible references than anything we text or even say. It’s possible to iron out the ambiguities that might crop up in conversation – tackle complexities that no Tweet could ever contain. In its lines we can exhort people to repent, point people to God’s comfort, encourage people to persevere, assure them of our prayers in ways that will linger deeply. And the knowledge that it is likely to be kept, disciplines us to be diligently prayerful and careful as we write.